Fewer people have hit the UK's Boxing Day sales this year as Black Friday discounts and savvy online shoppers lowered turnout. 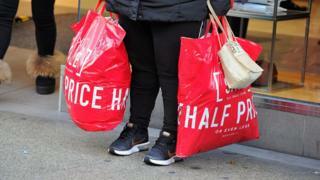 Shop visits dropped by 4.5% up to 5pm compared with last year, according to research group Springboard. Shopping centres and High Streets recorded the biggest declines. Diane Wehrle, insights director at Springboard, said that although it had expected a downturn, "the scale of the drop is greater than expected." She said: "What we have seen in the last couple of years is a structural shift in the Christmas trading period." While Black Friday sales have changed the way people shop in the UK, Ms Wehrle said the impact was particularly felt this year, as retailers began discounting a week before 24 November and carried on right up until Christmas. "The hotspots for Christmas trading around Boxing Day and New Year's Day are dissipating," she said. On the upside, Springboard said early indicators pointed to a strong rise in online shopping for the full 24-hour Boxing Day period. It expects internet transactions to surpass last year, when they rose by 6.2%. But Ms Wehrle said that people were increasingly looking online for bargains before they visited a store or deciding to "click and collect". As a result of this targeted shopping, there is less window-shopping and fewer spur-of-the-moment purchases. Footfall on UK High Streets fell by 5.8%, while in shopping centres, it tumbled by 4% in the first 17 hours of Boxing Day. Chris Daly, chief executive at the Chartered Institute of Marketing, said: "Gone are the days of setting the alarm at 06:00 to be first in line for the Boxing Day sales, something borne out by the footage of quiet shopping centres up and down the country." However, Hammerson, the property group that owns a number of Britain's largest shopping centres, said that about 600 people were lining up to grab bargains at the retailer Next's store in Birmingham's Bullring. Queues began forming there at half past midnight. Over the long term, Ms Wehrle believes that shopping habits in the UK have changed for good, with people looking for more of a "leisure experience" when they hit the stores. "If people go out to eat, they don't have money to spend in the shops," she said.